"A good artist lets his intuition lead him wherever it wants." See the Purple Heart Sword in Windows Media 9 (34MB)! This is my impression of a determined film student. For this 15 minute movie, I had to handle all aspects of its production. I played a role as director, writer, casting director, camera operator, photographer, choreographer, actor, sound editor, video editor, and postproduction special effects artist. Originally, the post production editing was done using two VCRs and a CD player. I was later able to digitally re-edit the original footage and add special effects when I bought a Matrox Rainbow Runner add-on card. 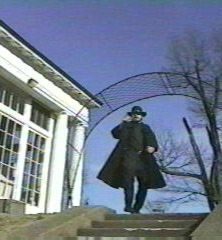 The original footage was filmed using a borrowed Sony mini-cam 8mm camcorder. This is a no budget student film. I chose a crew and actors among my friends based on their talent, abilities, and availability. The pictures seen here are captured stills from the final movie. Shown here is a still from the first fight scene. That would be me kicking the lovable hugable Chris Arden, who has become the star of many student films. This scene began with my jumping split kick, which took out Chuck Smith and Kevin Cliff. No one was hurt in any of the fight scenes. The Purple Heart Sword featured one staff fighting scene, two martial arts fight scenes, a fencing scene, and a lip synched music video scene. Not to mention a car chase between a Camaro and a Subaru Justy, 3D titles, and lightning special effects. Seen here is Danielle Perrone, who finally ends up in the posession of the purple heart sword. The sword, who's handle I carved from African Purple Heart hardwood, doesn't make an appearance until the end of the movie. 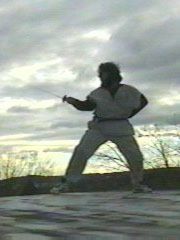 Shown at the right, is Eric Donelson in progress with his sword fighting scene with bad guy, Brett Stuart. This scene was filmed above the New Haven skyline. While I was shooting, friends in another dorm across campus were yelling "ADAM" to get their voices on tape. No lighting equipment was used, therefore when shooting outdoors, the time of day was an important factor. My shooting schedule was based on my chosen locations and lighting conditions at certain times, while taking into account the actors' schedules' and the deadline. The soundtrack to this movie includes music from Santana, Kashmia (Symphonic Led Zepplin), The Sugarhill Gang, Offspring, "O Fortuna" from the Carmina Burana, and Led Zepplin. � Adam Z Lein, 1999 All artwork property of Adam Lein, unless otherwise noted.